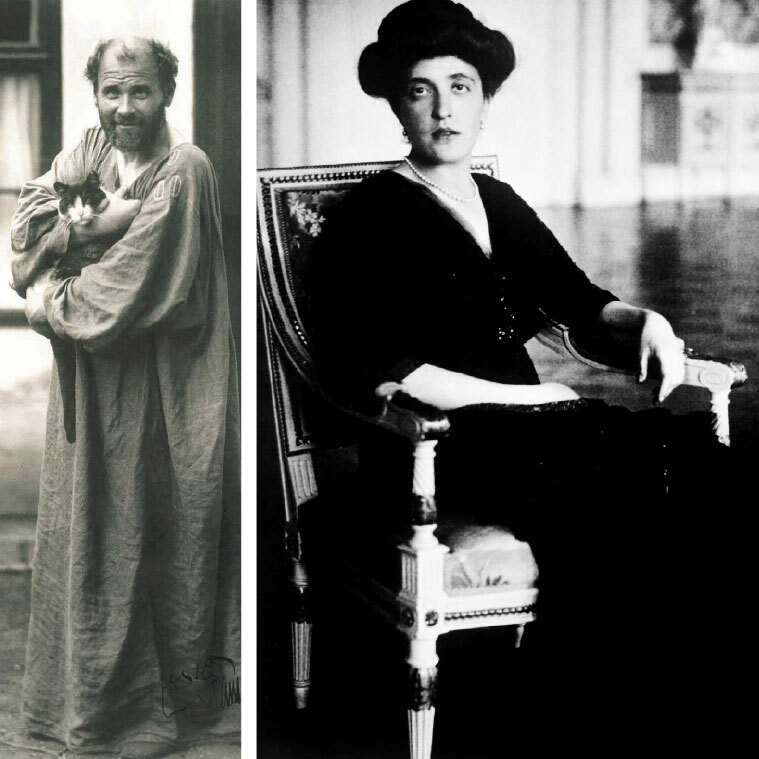 In August 1903, a 22-year-old Viennese Jewish socialite by the name of Adele Bloch-Bauer wrote to a friend that the renowned Austrian painter Gustav Klimt had agreed to paint her portrait. It was to be a commission from her husband, sugar industrialist Ferdinand Bloch-Bauer. The cost, according to Anne-Marie O’Connor’s book The Lady in Gold, was considerable—4,000 crowns at the time, or about a “quarter of the price of a well-appointed country villa.” Klimt could not start the portrait until winter, so it wasn’t until December that the young Adele ventured to his studio to sit for the portrait. Over the next four years, Klimt would make more than 100 sketches of Adele, spending countless hours alone with her in his studio. The dashing and magnetic Klimt was renowned nearly as much for his amorous adventures as for his daring art. There was speculation about an affair, but neither Klimt nor Adele left any evidence to that effect. The portrait, an iconic vision in gold, was finished in 1907 and exhibited for the first time that same year. A second, and quite different portrait, known as Adele Bloch-Bauer II (right), was commissioned a few years later and completed in 1912. Adele, in fact, was the only woman whom Klimt would paint twice. The second portrait depicts a more mature, more serious, more dignified Adele and reflects her position in society as part of Vienna’s cultural elite. Her elongated figure and elegant dress are embedded in a jewel-toned backdrop of richly patterned, almost abstract blocks of color, presaging Klimt’s later, more boldly colorful period. The first and better-known portrait, Adele Bloch-Bauer I (pg. 23), is typical of Klimt’s “Golden Period.” In it, Adele’s youthful sensuality, wistful, somewhat melancholy, smile and awkwardly posed hands emerge from an exotic, gold-leafed background of intricate, gemlike ornamentation. A brilliant melding of realistic depiction and abstract geometry, it aptly captures the spirit of fin de siècle Vienna. The positioning of her hands in both portraits was intentionally designed to hide a crooked finger on her right hand, about which she was extremely self-conscious. Left: Artist Gustav Klimt in his painting smock with his cat outside his studio in Vienna, ca. 1908. Both portraits, along with most of the Bloch-Bauers’ distinguished art collection, were confiscated by the Nazis in 1938-39. More than 65 years later, after a long and involved legal battle, the two portraits and four Klimt landscapes were repatriated to the Bloch-Bauer heirs—a tale chronicled in the recent film Woman in Gold, starring Helen Mirren as Adele Bloch-Bauer’s niece Maria Altmann. Described by those close to her as introverted, intense, moody and remote, Adele was largely self-educated. She read classic works in English, French and German and studied art, medicine, science and philosophy. A patron of the arts, she held salons that attracted some of Vienna’s most illustrious artists, musicians and intellectuals. A chain smoker, she was rarely without her long gold cigarette holder. Her circle of friends included Alma Mahler (widow of the famed composer and conductor), Czech-born author Franz Werfel, Karl Renner (the State Chancellor of the First Austrian Republic), and composer Richard Strauss. An independent thinker, Adele was an advocate of social reform, workers’ education and women’s suffrage. According to O’Connor’s The Lady in Gold, she was often tired and frequently suffered from headaches and other undefined ailments. She had several miscarriages, a stillbirth and one child who lived only a few days. She died in 1925 at age 43, apparently of encephalitis. Ferdinand was bereft. He created a kind of memorial in her room, hanging all of the Klimts there and even placing a photograph of the artist on her bedside table. The artist himself had passed away seven years earlier at the age of 55, likely as a result of syphilis. All of the paintings returned to the Bloch-Bauer heirs in 2006 were subsequently sold. Adele Bloch-Bauer II and the four Klimt landscapes went to private collectors. A special exhibition, currently on display at the Museum of Modern Art in New York City, showcases the rarely seen Adele Bloch-Bauer II, which is on long-term loan from a private collection. The golden-hued Adele Bloch-Bauer I was purchased by collector and arts patron Ronald S. Lauder for $135 million and is on permanent display at the Neue Galerie, the museum he founded in New York City. It is currently the centerpiece of an exhibition (on view through September 7) that includes preparatory sketches Klimt made for the portrait, photographs of the Bloch-Bauer family and Klimt, paintings and archival material.